Mayans made use of a very well-developed and advanced written language. Since the language comprised of symbols and images, resembling the language of ancient Egypt, the Spanish conquistadors termed it hieroglyphics. The individual units in the language, or its alphabets, were called glyphs. The use of Mayan hieroglyphics was limited to the Mayan priestly class. The priests used the language to pen down books on a wide range of subjects, including books related to astronomy, religion, mythology and mathematics. Mayan hieroglyphics were also inscribed on monumental structures as part of stelas or carvings. Researchers have been unable to peg a certain date on the origins of Mayan hieroglyphic language. The earliest extant written proof of the hieroglyphics is dated back to sometime between 300 B.C. and 250 B.C. However, most researchers agree that the hieroglyphic system had already been developed and was in use much before this date. Although of obscure origins, the Mayan hieroglyphic were the only well-advanced writing system that existing in the pre-Colombian Americas. The hieroglyphic language of the Mayans usually comprised of the use of individual alphabets which are called glyphs. The hieroglyphic language of the Mayans usually comprised of the use of individual alphabets which are called glyphs. Glyphs were individual units of language which usually comprised of one or more symbols and were used to denote a single phrase or a word. There were many different ways of spelling a single Mayan word, consequently Mayans had a large body of glyphs. Some of these are classified as logograms by the modern scholarship while others are categorised as syllabograms. Both were extensively used in Mayan hieroglyphics. Logograms were the more comprehensive type of Mayan glyphs. They were images or symbols which could be used to denote an entire word. For instance, if a single glyph could denote the name of a Mayan fruit, it was a logogram. The symbol of a logogram usually made a direct reference to the word it was used for. Logograms were useful for the Mayans because they served as a sort of shorthand, conveying a written message quickly and efficiently. Mayans had a vast variety of logograms. According to modern researches done on the Mayan language, the hieroglyphic system of the Mayans had as many as 550 logograms. Syllabograms were the other dominant type of alphabets, or glyphs, used in the Mayan language. Syllabograms comprised of individual syllables which corresponded to phonetic voices. To write down a single word or a phrase, Mayans conjoined multiple syllables and strung them together. Each syllable, in turn, was represented by a symbol or an image. This is why it is called a syllabogram since it’s a symbolic representation of a single syllable. 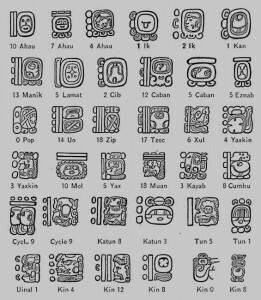 Mayan hieroglyphics had a total of 150 syllabograms. The sheer variety of the Mayan hieroglyphics made it possible for the Mayan to have a very flexible writing system. Since the glyphs were available both as logograms and syllabograms, Mayans could use of a quick logogram where they wanted to convey the message quickly, or could resort to the use of a syllabogram when they wanted to pen down in a more detailed and nuanced fashion. In many cases, a single Mayan word could be written by the use of a single logogram, or as two or three or even more syllabograms. In this way, nearly each Mayan word could be written in many different ways. After the Spaniards attacked and conquered Mesoamerica, they came in possession of many materials which had Mayan hieroglyphics inscribed on them. Accompanying the Spaniards were the Franciscan monks who set themselves to penning down and deciphering the Mayan hieroglyphic system. Bishop Diego de Landa, who was appointed the religious leader at the Mayan Yucatan region after the Spanish conquest, wrote down a key of the Mayan syllabary in an attempt to understand the structure of the language. Although he wrongly assumed the Mayan language to be alphabetic, the key he penned down proved critically helpful in later efforts to decipher Mayan hieroglyphics. The Mayans used a unique method of inscribing the hieroglyphic writing system. This was done by stringing together the glyphs represented a phrase into groups of 6. These 6 glyphs were then positioned in two parallel columns containing 3 glyphs each. They were read so that the reader began from the top left glyph, then moved to the top right glyph, then reached the left glyph on the second row, then the right glyph on the row and the same with the third row. If another phrase had to be added, it was added as a column of 6 glyphs to the right side of this column. Mayan had a large body of literature which they penned down in the hieroglyphic script. This included books called codices which were written by Mayan priests and ranged from topics about astronomy to songs, mythology, epics and more. After the Spanish conquest, many of these codices were deliberately destroyed. Some of them survived which were then used by the Franciscan monks in their attempts to decipher the Mayan language. These codices still exist today and have been instrumental in informing the modern scholarship regarding the Mayan language. Other sources which contain Mayan hieroglyphics include ceramics extant from Mayan cities, monumental structures in many Mayan regions and different works of art. Mayan hieroglyphics were the script of the Mayan written language. They comprised of images and symbols. Mayans either used a general symbol to directly denote a word or strung together a collection of symbols to mean it. Correspondingly, the hieroglyphics included two types of basic units, or glyphs. These were called syllabograms and logograms. Logograms directly symbolised an entire word while syllabograms furnished the many syllables which were conjoined to mean a word. Researchers had access to a large body of Mayan hieroglyphics even since the Spanish conquest of Mesoamerica. However, they weren’t able to decipher them adequately until as late as the second half of the 20th century. Today, most of the Mayan hieroglyphics have been deciphered.